A former college athlete, Jason grew up playing sports and has been living and breathing fitness for over thirty years. 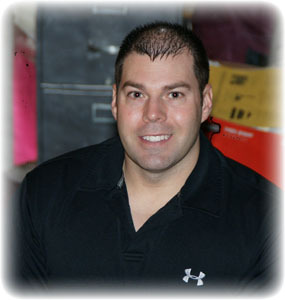 Jason has been with Schimmel Fitness since July 1999. He takes pride in his knowledge of nutrition and supplements. Jason attended John Glenn High School. Jason is a graduate of Heidelberg University with a degree in Health, Physical Education and Recreation. While at Heidelberg, he competed in football and track and field. He was all OAC in track and field. Jason was a team captain and also created and implemented the Track and Field Strength and Conditioning program. In 2010, Jason became part of the Heidelberg Athletic Hall of Fame and was joined by his brother Jeff Brock in 2013. Jason studied superior program design under Coach Elliott Hulse. Jason is currently consulting with Dr. Eric Serrano, the Chief Medical Director and Formulator (MP) Muscle Pharm on nutrition. Jason is a certified Personal Trainer, Nutrition Coach, Olympic Lift Instructor, Kettlebell Instructor, TRX Suspension Trainer, and Group Fitness Instructor. Jason is currently a member of the NSCA, NASM, ISSA & IYCA. Jason is an accomplished powerlifter, having held several state and national records. Jason still enjoys participating in numerous recreational sports and likes to be recognized as a coach who can sprint, jump, and lift alongside his best athletes to push them and himself to higher levels—keeping them healthy in the process. Jason is also the Athletic Performance Director and owner of www.SSPCamp.com, an Athletic Performance and Fitness based website.